Which Christ molded blending with a foreign mold. Saint Plato was born in the year 735 into a pious Christian family, and his parents were named Sergios and Euphemia. A pestilence that raged at Constantinople deprived him of his parents when he was no more than thirteen years of age, therefore the care of his education rested upon an uncle, who was high treasurer. Plato, while yet young, dispatched the business of that high office for his uncle with surprising readiness and assiduity. In knowledge and piety, he far exceeded all his equals in age, and went beyond the greatest expectation of his masters. When he grew up, he began life on his own. The Saint occupied himself in the early years in the management of the property which his parents had left him upon their death. He was very temperate and hard-working and acquired great wealth by his toil. However, the future monk’s heart blazed with love for Christ. Persons in the highest stations at court wished to make him their son-in-law, but his whole heart being attached to heavenly things, he looked with contempt on the pomps and vanities of this world. He prevailed on his three brothers to devote themselves to God and live in a state of celibacy. Furthermore, he made all his slaves free, and having sold his large estates, he portioned his two sisters, who, marrying, became the mothers of saints. The remainder of the purchase-money he distributed among the poor. After this he withdrew to a monastery named Symboleion near Mount Olympus at the age of twenty-four. He took with him one servant as far as Bithynia, but there sent him also back, having given him all his clothes, except one coarse black suit; and in this manner he walked alone to the Monastery of Symboleion. From the moment he was admitted into that monastery, no one was more humble, more devout, more exact in every duty, or more obedient and mortified. 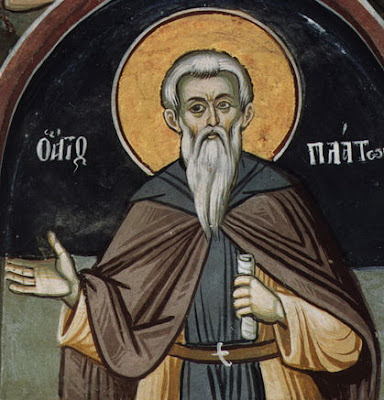 The holy abbot Theoktistos, to furnish him with opportunities of heroic acts of virtue, often reproved and punished him for faults of which he was not guilty: which treatment Plato received with silence and joy, in patience and humility. His prayerful zeal, love of work and geniality won him the love of the brethren. When he was not praying and reading, he made bread, watered the grounds and carried dung, though his usual labor was that he copied service books, and compiled anthologies from the works of the holy Fathers. When the head of the monastery Theoktistos died in 770, the brethren chose Saint Plato to be their abbot, even though he was only thirty-five years old. He never drank any thing but water; and this sometimes only once in two days. His diet was bread, beans, or herbs without oil, and these he never consumed even on Sundays before noon. He would never eat or wear anything which was not purchased by the labor of his own hands; by which he also maintained several poor. After the death of the emperor Constantine Kopronymos in 775, Saint Plato went to Constantinople where Patriarch Paul endeavored to make Plato the Bishop of Nicomedia. Not wanting to take such a position, nor to be ordained at all, Plato returned to Symboleion. Around that time his sister Theoktista decided to embrace the monastic life, so Plato established the Sakkoudion Monastery on a family estate near Mount Olympus. In 782 she prevailed over him to lead the monastery, and leave behind Symboleion. He was followed by his nephews Theodore (Nov. 11) and Joseph (Jan. 26). When Patriarch Tarasios and the empress Irene convened the Seventh Ecumenical Synod in Nicaea in 787, Plato took an active part in its work. Being learned in Holy Scripture, he successfully unmasked the error in the Iconoclast heresy and defended the veneration of holy icons. In 795 the emperor Constantine VI (780-797) forced his wife to become a nun, and he married one of Plato's relatives, Theodota. Even though the holy Patriarch Tarasius condemned this marriage, Joseph, a prominent priest of Constantinople, violated the Patriarch’s prohibition and celebrated the marriage of the emperor. When they learned of this, Plato and Theodore excommunicated the emperor from the Church and sent a letter about this to all the monks. The enraged emperor gave orders to lock Plato in prison and to banish Theodore to Thessaloniki. Only after the death of the emperor in 797 did they receive their freedom. This is known as the Moechian Controversy. The Saracens were excursions as far as the walls of Constantinople, therefore the monks of Sakkoudion abandoned their settlement, and chose that of Studion, which had been almost destroyed by the persecution of Constantine Kopronymos. Theodore settled in Constantinople and became abbot of the Studion Monastery. Plato lived as a simple monk at this monastery under the obedience of his nephew. There they built a church in honor of the Holy Apostle John the Theologian. Living by himself as a recluse in a narrow cell, Plato was in perpetual prayer and manual labor, having one foot fastened to the ground with a heavy iron chain, which he carefully hid with his cloak when any one came to see him. In 806, Saint Nikephoros, a layman, though a person of great virtue, was elevated to the patriarchal dignity by the emperor of the same name. Saint Plato judged the election of a neophyte irregular, and on that account opposed it. When the new emperor Nikephoros (802-811) returned the excommunicated priest Joseph to the Church on his own authority in 807, Plato and Theodore again came forward denouncing the unlawful activities of the emperor. For this the brave confessors were again subjected to punishment. The emperor, provoked at his zeal, caused Plato to be guarded a whole year by a troop of insolent soldiers and false monks; after which he obliged him to appear before a synod of bishops, by which he was unjustly condemned, and treated with many indignities, and at length, with the most flagrant injustice, pronounced guilty of the fictitious crimes laid to his charge; in consequence of which sentence the emperor banished him, and commanded that he should be ignominiously conducted from place to place in the isles of the Bosphorus for the space of four years. Notwithstanding he was at the same time afflicted with many distempers, the Saint endured the fatigues of his exile with an extraordinary degree of constancy and courage, which had such an effect on Nikephoros, that he had resolved to recall him with honor, and pay him the respect such distinguished piety merited; but, unfortunately, the emperor’s murder by the Bulgarians, in 811, frustrated those good intentions. But his successor, Michael I, a lover of justice and virtue, immediately gave orders that Plato should be honorably recalled. The Saint was received at Constantinople with all possible marks of respect and distinction, but privately retired to his cell at Studion. After some time, perceiving himself near his end, he directed his grave to be dug, and himself to be carried to it and laid down by it. Here he was visited by the chief persons of the city, especially by the holy patriarch, Saint Nikephoros, who had satisfied him as to his conduct in receiving the priest Joseph, and who came to recommend himself to his prayers. After his recall Plato lived three more years occupying himself with work and prayer, and departed to the Lord on Lazarus Saturday at the age of seventy-nine, on April 8, 814. His encomium was written by his nephew Theodore, based on the encomium of Saint Gregory the Theologian for Saint Basil the Great.